Good morning! It’s Friday! Just a few more days until the big days! This is one of my favorite songs in the Bible. We affectionately call this Mary’s Magnificat. This song is her response to being called upon to carry Jesus in her womb. 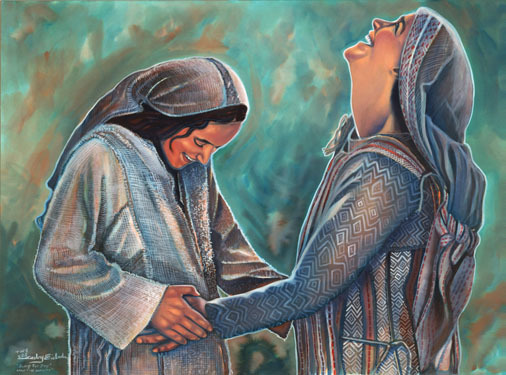 The gospel of Luke really focuses in on the experience of Mary before Jesus’ birth. We will see on Sunday that Matthew will focus more in on Joseph. But Luke, remembers the story of Jesus’ mother. She is young. She is unwed at this time. She is very very poor. And she is instrumental. So often when we talk about Mary we talk about her response to God. I have heard that her response is immediate by so many preachers. What I actually love about Mary and this particular piece of the story is that it really wasn’t immediate. Yes, Mary responds in this joyful matter but we sometimes neglect that the angel comes to her, then she goes to visit her cousin, THEN she response with this beautiful poetry. Because of how short the story is in Luke, we forget that it would have taken a few days to walk from her location to Elizabeth’s location. They were about 100 miles apart. Mary takes off immediately after the angel Gabriel talks with her. This makes sense to me. She just received jarring news and she has to go to someone safe. Someone who will understand that God does crazy things. Oh yeah, she has a cousin who is married to a religious authority. Elizabeth is wise and sage like. She travels to her. Could you imagine the things this new young mother thinks about on the road? I can imagine her getting a little angry at God for messing up her marriage…what if Joseph rejects her? What if she is publicly shamed? God wouldn’t allow that, right? Then perhaps she starts thinking through what she will need to have a baby. What will the baby look like? Then maybe she gets excited knowing that she is to have a little boy. He must be blessed because God has done this thing. Then she starts pondering…why did God pick her? She is poor. She doesn’t have the resources. She is on the outskirts. As she approaches Elizabeth’s house…joy wells up inside because she has walked and processed and walked and processed. God must be amazing if God chose her. God MUST be doing a new thing if the baby will be born on the margins…. Her song then is about lifting up people like her. Her song is about how God is doing a new thing and a new way of authority must be if she is going to be ok. This makes all the difference in my mind. Too often we say “Be like Mary…say yes and rejoice in the call right away.” If we do that, we miss the important processing, walking, talking with God. We do a disservice to this story. Mary sings out because she has had time to soak and revel and dwell in what is being asked of her. She isn’t pushed into this new experience without taking a pilgrimage to her safe spot. God has to work in her just like when God works in us to get to a yes. Take time today to dwell in that pregnant space. Talk with God. Walk a little. Process and keep quiet for a bit before we get to singing out.